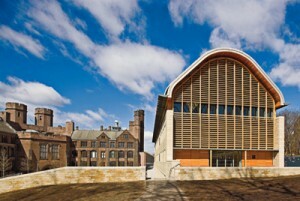 RCC President Bob Musil speaking at Yale’s School of Forestry and Environmental Studies. Why are Rachel Carson’s papers housed at Yale’s Beinecke Rare Book Library? The answer is two-fold, Musil explained. First, Rachel Carson was very grateful for the assistance and support of two Yale professors, Daniel Merriman, an oceanographer and Master of Yale’s Pierson College, and Paul Sears, the first Professor of Conservation at the School of Forestry and Environmental Studies. Aside from scientific help, Sears stood by Carson publicly when she was under attack from corporate polluters and right-wingers and wrote several positive reviews of Silent Spring that helped answer her critics. Secondly, and critical to the placement of the Carson archives at Yale, was the decision of Marie Rodell, Rachel’s friend, confidante, and literary agent. When Carson died of breast cancer in 1964, the Beinecke was the new, world-class facility for the documents of American literary figures and Rodell knew that Carson was deeply appreciative of Merriman and Sears. Musil also let his Yale audience know that Rodell was the literary agent for Helen Gahagan Douglas, the 1948 Senate candidate attacked as the “pink lady” by Richard Nixon, and of the first book by Martin Luther King, Jr., Stride for Freedom. The lesson Musil told Yale’s emerging environmental leaders is that Rachel Carson is indeed one of the great leaders of the environmental movement, but that she was surrounded by a network of active researchers, friends, political allies, and organizations and should not be seen as a lone, Olympian figure who changed history simply by writing one book. Musil also described his own book and the women in it and is work as the head of the Rachel Carson Council. He asked the graduate students, in particular, to dedicate themselves to a future of environmental leadership, advocacy, and action. 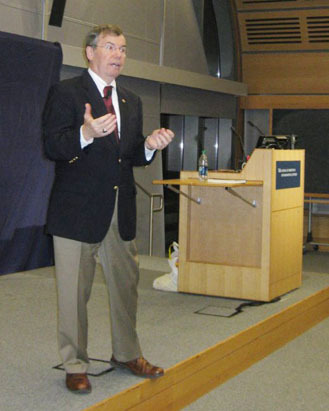 Musil was invited to Yale by Dean Peter Crane, introduced by environmental historian Paul Sabin, and met with students from a class on environmental biography and leadership led by Frances Sawyer. Yale is also now a member of the Rachel Carson Campus Network. As Yale professors did in support of Rachel Carson, the current generation of Yale environmentalists has pledged to help continue her legacy and work through the Rachel Carson Council.